The global conservation movement has reached a critical point. We have long documented the fast pace of habitat loss, the increasing speed of global climate change, and the growing number of endangered and extinct species. However, there is hope. Smithsonian scientists, researchers and conservationists are taking part in global efforts to bring species back from the brink. We're tackling challenging conservation issues by discovering and sharing knowledge about animal behavior and reproduction, ecology, genetics, migration and sustainability. The results are promising. Two litters of endangered red pandas were born at the Smithsonian's National Zoo. A herd of 25 Scimitar-Horned Oryx, extinct in the wild since the 1980s, was reintroduced in Africa. The variable harlequin frog, once decimated by disease, has been returned to the wild in Panama. But the Smithsonian can't do this work alone. We count on people who share our passion for conservation and the science that goes into preserving and protecting threatened species. Will you join us? 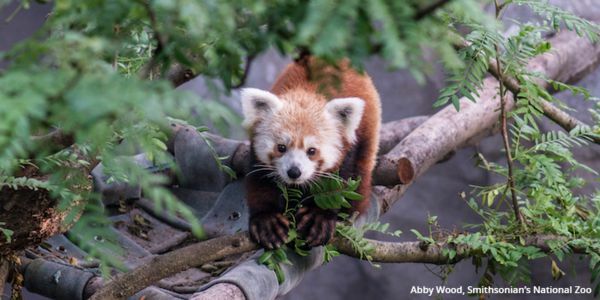 Sign and support the work of Smithsonian scientists to protect wildlife!